I was fortunate in one aspect of my career. I played in the blessed eleven from Oxford and Cambridge which went to Barnsley, of all places and beat the might of Yorkshire. It was one of those experiences a fellow cannot forget. And yet its origins were mild and unsuspecting. None of us really wanted to go to Barnsley at all (though students, we were not fools). We’d lost our previous three qualifying games by handsome margins, besides which our exams (for which some of us were as well prepared as Britain was for the Second World War, though in our case the blame lay not with the presence of writing on paper but rather in its absence) were just around the corner. We collected in our wheezing, reluctant cars on a surprisingly benevolent Friday evening. Not for we impoverished students the swish vehicles of the select. Our car belonged to an M. E. W. Brooker, a medium pacer of more distinction than fame (he was very obscure). To be honest I haven’t seen him since and he has rather faded from memory but ever faithful Wisden recollects that next day he was to dismiss Colin Johnson, Peter Squires and David Bairstow at a personal cost of 44 runs. Probably he has returned to the Northern Hinterland never again to emerge and probably he remembers this game with as much affection as I do. As we drove north and then into the grimy red brick town of Barnsley we once again wondered what on earth we were doing in such a place a few days before we were due to face our examiners. We’d read about these smokey, gritty northern towns and fully expected to bump into Michael Parkinson walking down the street in a raincoat on his way to collecting his fish and chips from a cafe belonging to Alf and Enid. We moved through narrow streets lined with these red determined houses until finally the centre of town opened in front of us and we found our hotel which was not in the least as we’d imagined (all Bairstow and Bradford millionaires) but was instead hospitable and warm. Maybe tomorrow would not be so awful after all. We met the Oxford lads and asked Steven Coverdale our resident Yorkshireman, though not a chap to be taken entirely seriously (as his nickname of ‘Brian’ indicated) to advise us upon the characteristics of the Yorkshire bowlers. We should have known better. Yorkshiremen are raised to believe in the godliness of all Yorkshire cricketers. Chris Old, it emerged, could swing the ball both ways, cut it off the pitch, vary his pace and deliver a deadly yorker. Thank heaven he could only bowl 11 overs next day. Arthur Robinson it appeared was just as good. So was Steve Oldham, Howard Cooper and Alan Ramage. With the ball they were masters. Brian reckoned so anyhow. According to him we’d be lucky to hit the ball at all. Gradually we realised he was a victim of upbringing and went to our beds hoping that Coverdale had not done as good a job as Macbeth on murdering sleep. The ground was brimful as the game began and bulged in places. We were not used to this and wondered if we’d make fools of ourselves. Geoff Boycott poked his head around our door to wish us luck speaking in that enigmatic way which hinted at a belief that kids like us would need lots of luck against a team from Yorkshire. Good Lord, even he had swallowed the myth. Of course Wingfield-Digby struck first ball. Yorkshire promoted Chris Old to first wicket down, a sign of panic. Old fell third ball, signalled lbw by old Tommy Spencer whom, it was widely agreed, couldn’t see that far and based his decisions largely upon guesswork. Athey fell next bringing in John Hampshire, the hope of all Yorkshire. Alas John tried to break his duck by risking a single to mid-on who, and this surprised his colleagues, appalled Hampshire and astounded himself, threw down the wickets. On the only other occasion I ran a chap out he’d turned for his fourth and Vic Marks had opined “they should know you can’t run four to Roebuck”. Despite a kick for four overthrows and a few lapses in the field Yorkshire reached only 185 for 7. David Gurr, Vic Marks and Mark Brooker had been economical while the spell of R le Q Savage and A. R. Winfield-Digby which had been cast over this mining ground had never been broken. As we left the field it was unclear whether my opening partner was to be Coverdale or an elfish Sri Lankan called Gajan Pathmanathan. Murrills sought my opinion. I said “choose Pathmanathari” on the ground that he might play the ball on its merits rather than as if it possessed the devilry of a bad-tempered snake. He did nothing of the sort. He planted Chris Old’s first ball over his head and hooked his second. I’d read about this sort of thing in Edwardian coaching manuals but had never seen it put into effect before. 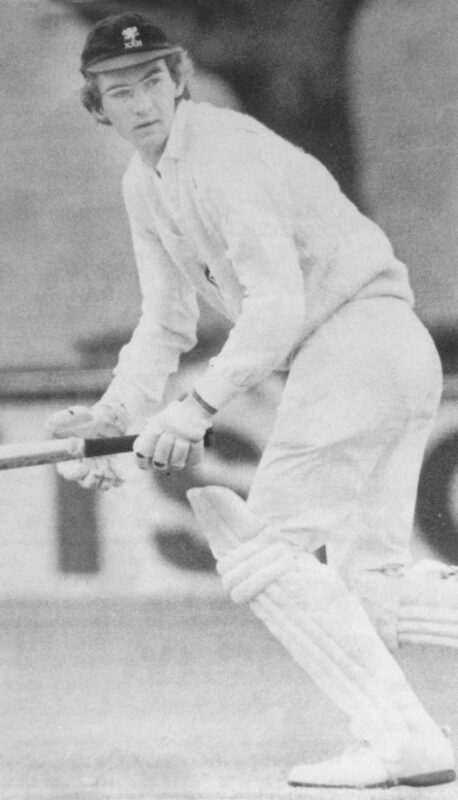 Gajan hit boundary after boundary off England’s opening bowler, hitting fearlessly and with panache. Old retired, the crowd shocked into silence after having 56 runs taken off his four overs, some of which he’d bowled to me. Gajan was brilliant, every shot a dainty flash of wrist and thin arm. Yorkshire had not been brought up on this sort of thing. Openers were supposed to play themselves in and play in the crease. This was the land of Sutcliffe, Hutton and Boycott, the land of austerity and left-elbow. We reached 82 in 15 overs and then both fell, Pathmanathan’s contribution being somewhat larger than mine. He’d broken Yorkshire’s spirit and it was left to Chris Tavaré, Paul Parker and Vic Marks to complete an incredible victory. They finished in style as the crowd thinned, the local people shuffling away, scarcely able to believe their eyes. It was a hell of a day. Boycott popped in again to say that when he’d wished us luck he hadn’t meant “that much bloody luck!” Coverdale was shocked. If he’d had to bat he’d have failed for he’d been jittery all day. We piled into our Morris Minor and headed for home, spirits high, ready for anything the examiners could throw at us. We’d wondered why we’d gone to Barnsley in the first place. You never can tell with cricket when or where it is going to lift you. It’s never wise to take a chance. To have missed Barnsley would have been a terrible shame. New recruits at pre-season fielding practice. 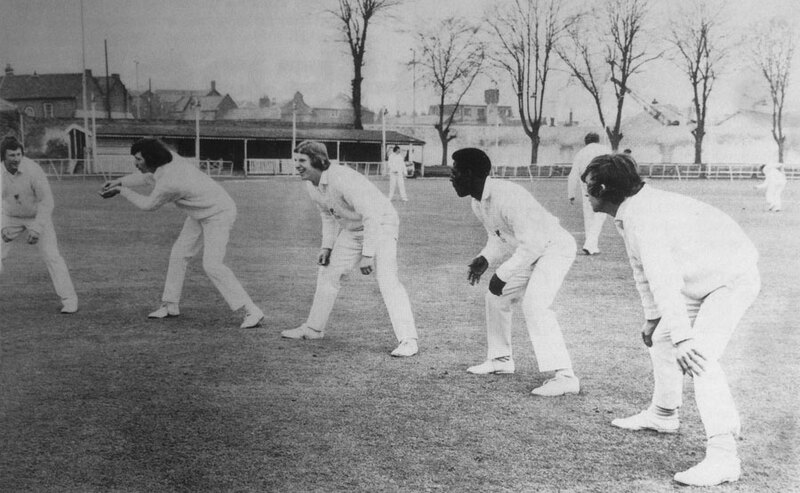 Left In right: Marks, Hook, Botham, Richards and Roebuck.